Through the Street Banner Art Program, artists create unique banners for the light posts in Whistler. Each series is displayed for two seasons and then sold to the public. Revenue from banner sales contributes to future public art projects. 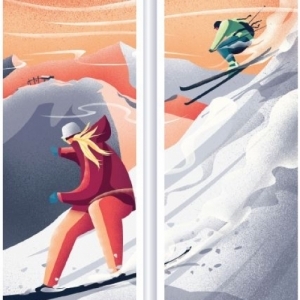 The Resort Municipality of Whistler (RMOW) invites artists to submit proposals for the design of a spring/summer series of street banners. More information can be found here. The competition for the Spring/Summer 2017 series was won by artist Laura Bifano for her proposal “‘Whistler Vistas." The competition for the Spring/Summer 2015 series was won by artist Sarah Turton. Her series was titled “Explore, Admire, Celebrate, Cruise". The Banners to Bags program turns retired street banners into reusable bags, breathing new life into these banners. Now they can be enjoyed as reusable shopping bags, reducing our dependency on plastic bags. 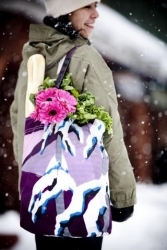 Each bag is an artist’s unique creation and is a piece of Whistler’s cultural heritage. Local organizations, businesses, and visiting conferences have the opportunity of selling the bags as a product or fundraising item, with the remaining proceeds going towards the Municipal Art Fund.